This Sugar Free Pumpkin cheesecake Recipe is a low carb, gluten free dessert your family and friends will love. Holiday dessert tables need a few low carb. gluten free, sugar free desserts. There is always a few special dieters in the crowd. 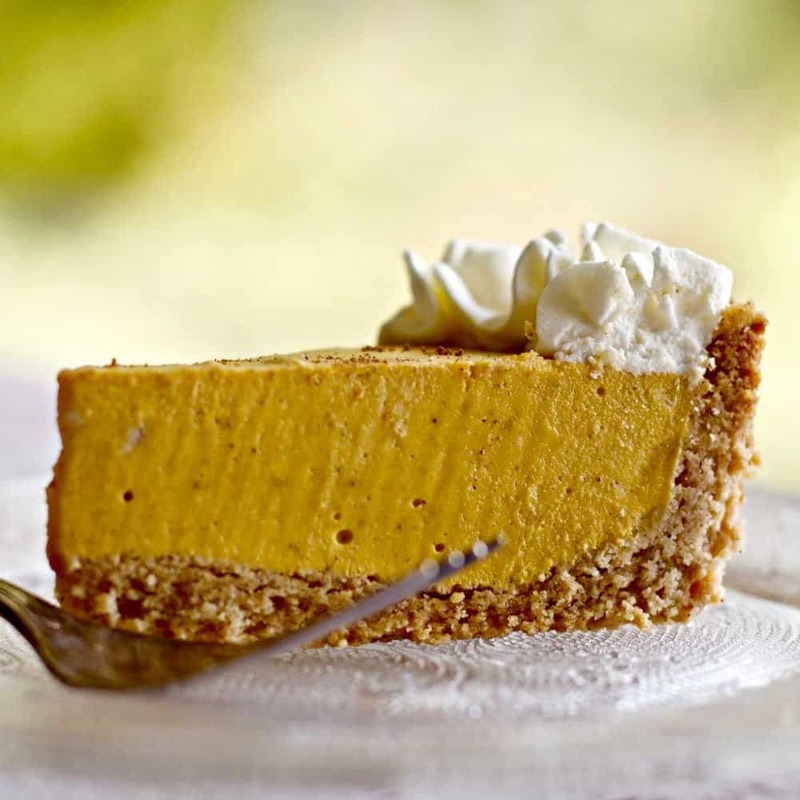 This Sugar Free Pumpkin Pie is also low carb, and gluten free. Our eldest granddaughter set this pic up. Lovely! I don’t usually worry about low carb cooking. 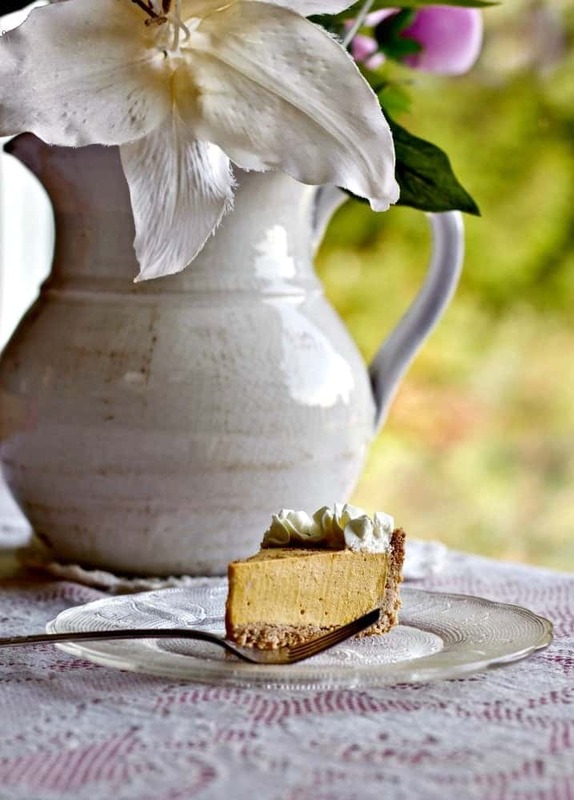 This blog has its share of luscious, carby, sugar sweetened desserts. Unfortunately, our daughter, Kayti, contracted gestational diabetes. So recently I’ve been studying sugar free desserts for diabetics. Sugar free and Low carb. Diabetics need both. And the gluten free is there because…yeah the almond flour crust replaces a wheat flour crust. Kayti enjoyed this Sugar free cheesecake dessert. My husband and I also thought it was great. This healthy sugar free pumpkin recipe is even kid approved! Our three granddaughters (here for a slumber party) each happily ate a piece…for dessert. And then ate another piece the next day. In fact, they helped me photograph it. Aliyah has quite the eye. She set the stage for this photoshoot. 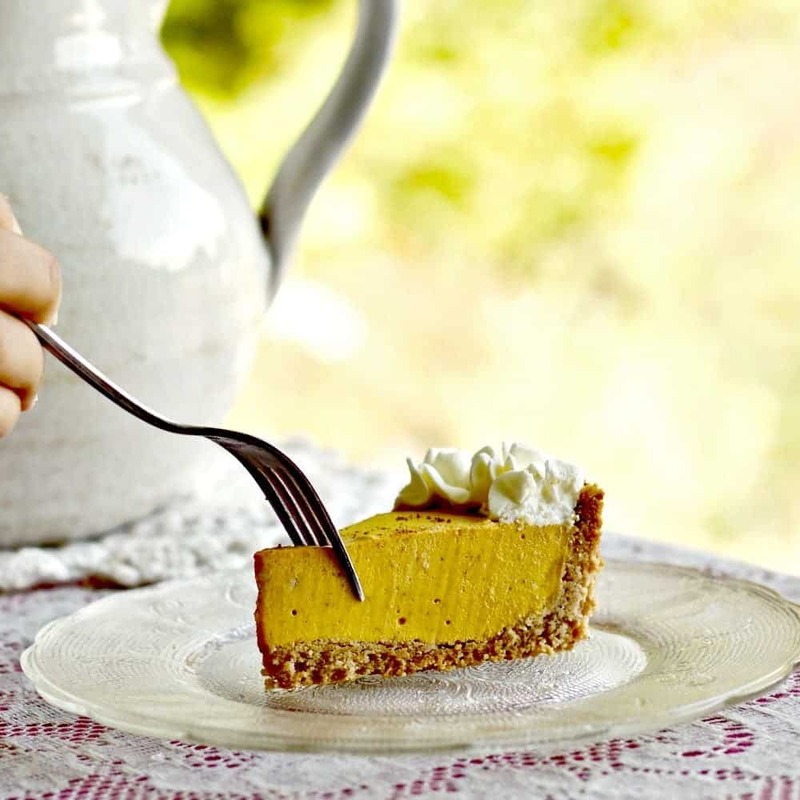 Sugar Free Pumpkin Pie is made with gelatin for a quicker set. We enjoy the texture of this low carb treat. 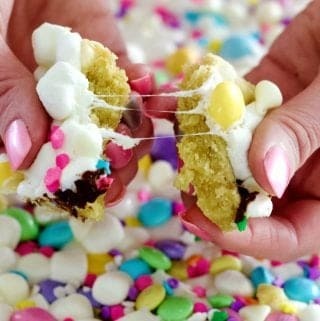 We also like how easy it to make! Kayti (our cupcake corner creator) is so frustrated. She is in every low risk category for gestational diabetes. Sigh…. She got it anyway. She is very grumpy that in her third trimester she is actually losing weight and suffering pumpkin dessert cravings. Right in the middle of Fall Baking! So sad. Plus she has to poke her finger several times a day and read her glucose numbers. She really hates poking her finger. The good news is, so far, she and the baby are doing fine. She has other risks in this pregnancy. She is really walking a tightrope without a net on this one. Everyday she progresses without delivery is a really good day. So yes, we are focused on getting her diet squared away. She. 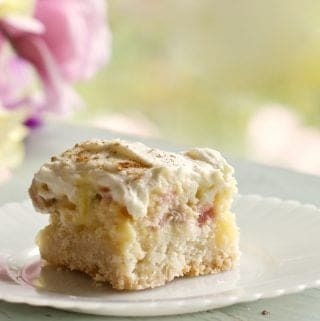 of course, has a HUGE sweet tooth so we are creating this sugar free dessert recipe just for her. AND for you. UPDATE: Kayti and baby Jackson are well now. Both of them had some challenges to delivery and well after. Both baby and mama got through finally and are fit and fine with no diabetes. We are very grateful for their good health. Aliyah is putting her fork in the yummy filling. 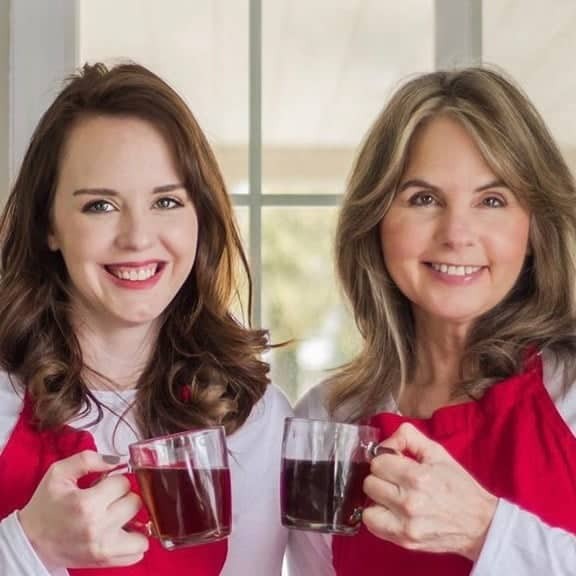 About the time Kayti failed her glucose test I was approached to join recipe makers using Steviva Brand sugar substitute products in a recipe contest. Excellent timing for us. Thank you Steviva! So I’m experimenting with this healthy dessert idea. Please let me know if you like it. Our family did. And that’s saying a lot. We tend to be fussy about our sweets. This sugar free cheesecake recipe is a win. I really like how easy it is to make too. If you need a sugar free cheesecake to add to your dessert table. This is a good choice. I have shied away from sugar substitutes in the past. They tend to taste bad. The Steviva products I have tried have worked well for us. They are made of natural ingredients and my husband will eat them too! Dave has a ferocious sweet tooth so I’m planning to make more recipes using these natural sugar replacers. Sugar free low carb desserts make a lot of sense. Kayti is showing us diabetes is no fun! 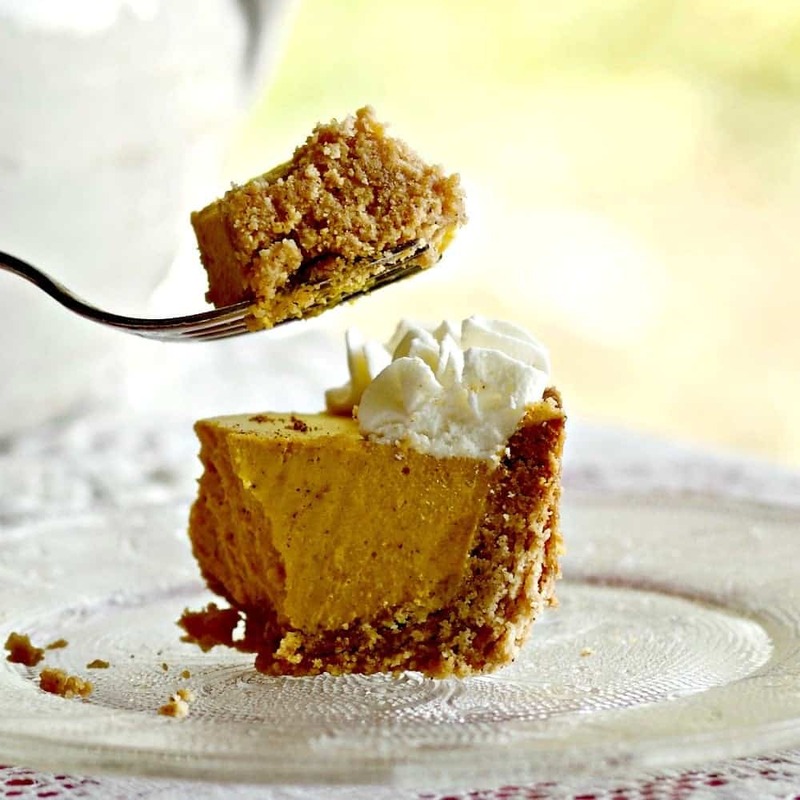 This sugar Free Pumpkin Cheesecake is our favorite Steviva recipe so far. It’s so useful to have a holiday no bake sugar free dessert recipe that is also gluten free and low carb. We hope you enjoy it! If you purchase from our Affiliate Links we may receive a small commision at no extra charge to you. Thank you for supporting Homemade Food Junkie. This is a VERY easy healthy dessert. I’m actually so excited about the no bake gelatin cheesecake idea that I plan to make more gelatin cheesecakes in the future WITHOUT pumpkin. If you like a sweeter cheesecake filling feel free to add more sweetener. A few of our tasters mentioned the filling could be sweeter. It’s all what you are used to. The crust and whipped cream was sweet enough for everyone. Americans love sweet! This pie lasted four days in the fridge uncovered and was fine. It’s a good make ahead dessert for that reason. It’s also a much faster set cheesecake than my low carb crustless cheesecake. You could also make that recipe as sugar free dessert if you prefer. But this gelatin recipe is really good and very easy. Combine the almond flour, sugar substitute and cinnamon in a food processor and pulse until blended. Gradually add in the oil and pulse until crumbly. Press into a nine inch springform pan. Sugar Free Pumpkin Pie. 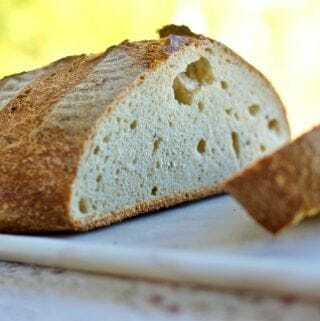 We love this crust. Everyone commented on how yummy it was. Even the kids! Combine gelatin, Steviva blend and boiling water. Stir until completely dissolved. Set aside. (The gelatin mixture will set if you make it too far ahead of use-but do give it time to cool before adding it to the recipe). Beat cream cheese, pumpkin puree, vanilla and spices until smooth. Gradually add the gelatin mixture into the cream cheese mixture while beating. Beat until mixed. Aliyah is putting her fork in it. The filling sets up in just two hours in the fridge. The gelatin makes this a really easy recipe! After you pour the filling into the crust let the cheesecake rest for 2 hours in the fridge until set. This cheesecake can easily be made a day ahead of serving if stored in the fridge. 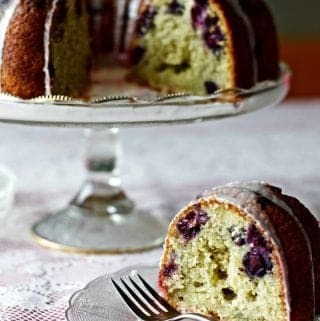 Do not tightly wrap it but a cake cover of some kind will help it stay moist. I suggest you Garnish just before serving or on the same day if you make it ahead. Homemade whipping cream will break down after a while. It’s best served fresh! Beat the whipping cream and [easyazon_link identifier=”B01B8BSRHW” locale=”US” tag=”homefoodjunk-20″]Steviva MonkSweet+[/easyazon_link] until stiff. With a piping bag and a Wilton 2 D tip. (Or whatever you prefer) Decorate the top of the pumpkin pie. sprinkle with pumpkin pie spice for a dash of interest. Sugar Free Pumpkin Cheesecake makes a pretty healthy dessert on your holiday table everyone will enjoy. This recipe is a suitable keto dessert. It has 6 net carbs. Pumpkin is low carb when you take the fiber into account. It’s also EXTREMELY good for you. The gelaint in this recipe also adds protein. 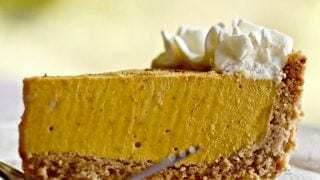 Put this low carb pumpkin cheesecake on your dessert menu and live guilt free. 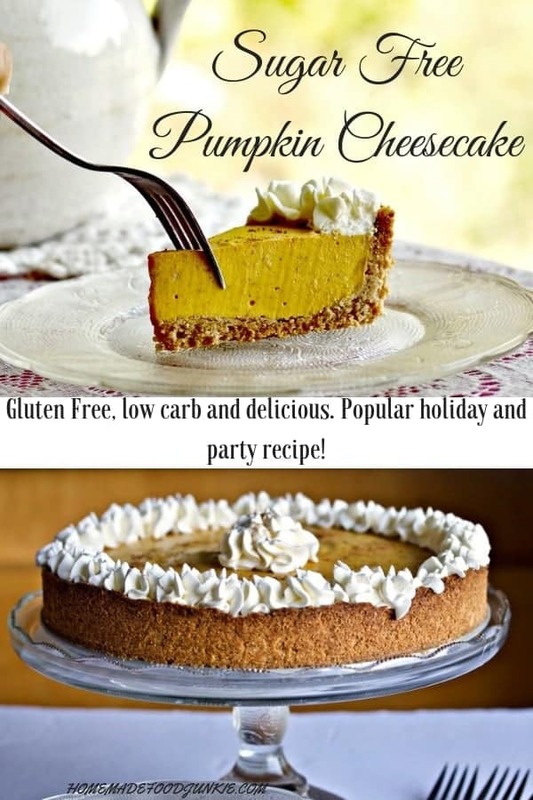 This Sugar Free Pumpkin Cheesecake is also low carb and gluten free. Gelatin makes this cheesecake a quick and easy, make ahead dessert. Such a lovely recipe for your holiday dessert table. Combine the almond flour, Stevia Blend and cinnamon in a food processor and pulse until blended. Press evenly into the bottom of a nine inch springform pan and up the sides about an inch. Combine gelatin, Steviva Blend and COLD WATER. WHISK UNTIL THE GELATIN IS COMPLETELY dispersed. (if you put the gelatin into hot water first it immediately clumps and cannot dissolve). NOW add the boiling water. Stir until completely dissolved. Set aside. With an electric hand mixer beat the whipping cream with the Steviva MonkSweet+ sugar replacer until stiff. 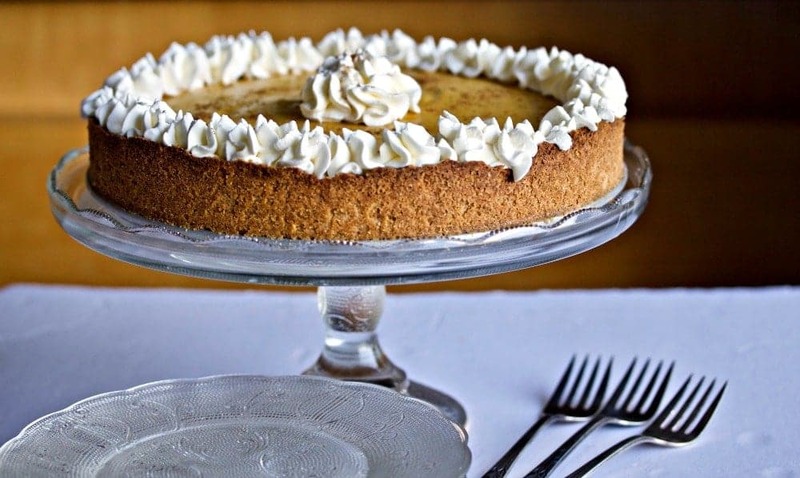 Decorate the top of your cheesecake as preferred or serve the cheesecake with the whipped cream on the side. I used my Wilton 2D tip and piping bag to finish my cheesecake as you see. I also sprinkled a bit of pumpkin pie spice over the top for added interest. This cheesecake can be made ahead the day before if kept in the fridge with a cake cover over it. 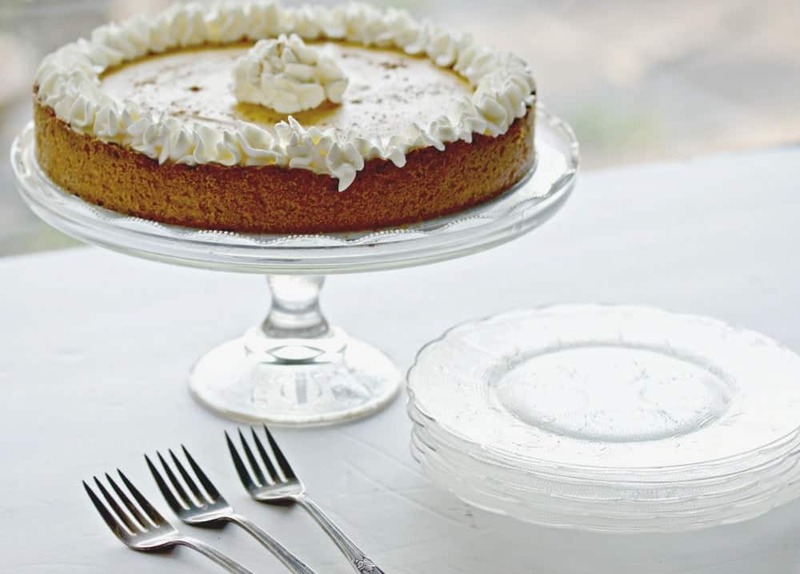 Make the whipped cream topping and decorate day of serving for best results. If you really love a sweet cheesecake add more sugar replacer to the filling instructions according to your own preference. The times mentioned in the recipe do not include the 2 hour setting up time in the fridge. There are 6 net carbs in this recipe. In my internet research I found both Sugar Free mom and Low Carb Yum to be great resources. If you need inspiration for low carb or sugar free recipes be sure to check them out! I am so sorry you’re facing diabetes with your hubby. Yes it’s the carbs that need to go. We have several low carb recipes and more coming all the time. I hope he enjoys this as much as our family does. My husband LOVES this recipe. All the best and thanks for subscribing. I look forward to hearing more from you! How much butter for crust? How much boiling water for filling? Hi Amy, Thank you SO much for your questions. I have vetted this recipe, updated the info you requested and added more nutritional information for you. I hope you let us know how this recipe works for you. Have a great day!